Super Bowl Sunday is fast approaching, with another huge crowd set to tune in to watch the defending champions, the Seattle Seahawks, battle it out against the New England Patriots on Feb 1, 2015. The Seahawks, returning for the second consecutive year, lead the 2014 rankings for the best scoring defense in the National Football League (NFL). Conversely, the Patriots finished the 2014 regular season ranked the second best offensive team in the NFL. So from where will the defining MVP performance that decides the championship come? Historically, we can see that the Quarterback (QB) traditionally shines on Super Bowl Sunday, leading their team to NFL glory. Out of the last 48 Super Bowls, 27 MVP prizes were awarded to the QB (56% of all Super Bowl MVP awards). Gridiron is a complex game of numbers, with figures existing for very niche categories, helping fans and commentators pick apart every possible component of the NFL and its athletes. 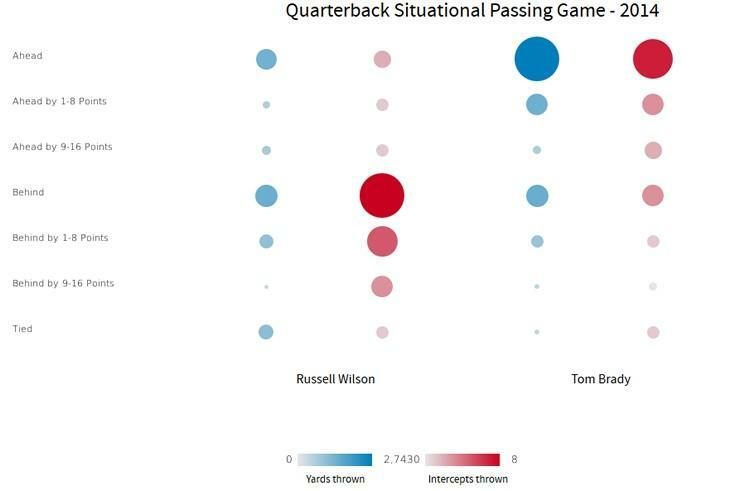 We used Business Intelligence to sort through the almost endless stores of statistics, and then applied data visualization to paint a clearer picture, allowing us to see which QB will most likely win the coveted MVP prize at Super Bowl XLIX. Introducing the veteran QB, Tom Brady, of the New England Patriots. Owner of three Super Bowl championship rings, Brady scored a total of 33 Touchdowns (TD) in the 2014 season. Enter third year QB, Russell Wilson, of the Seattle Seahawks. Backing up his spectacular feat of taking the Seahawks to the XLIIX Super Bowl in just his second NFL season, Wilson threw 20 TDs and ran six TDs during the 2014 season to take his team into the big game once again in 2015. So now we know our two most likely MVPs for Super Bowl 49, what factors of their games will help steer their respective teams to a Championship and, in the process, make them best afield this Sunday? 100 yards is a long way to go for a touchdown. Breaking the field down into four quarters (1-20, 21-50, opposing 49-20 and 19-1 yard lines), we can see where these QBs are most reliable when completing their passing attempts. Brady demonstrates his dominant throwing arm with a high completion rate close to the attacking end-zone. His passing game was in fine form over the 2014 season, with a 59.3% completion rate in the final section of the field (opposing 19-1 yard line). That’s a completion rate 11.8% greater than Wilson, his opposing QB, at his respective attacking end. It’s therefore no surprise that Brady finished the season with a total of 33 TD passes. However, Wilson was extremely proficient when it came to getting his team out of their own defensive quarter in 2014, with a 77.1% completion rate between the 1-19 yard line. 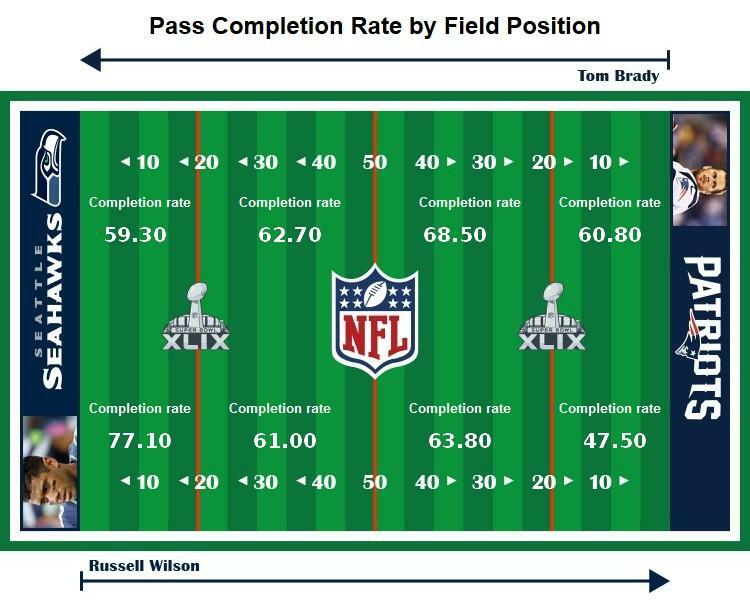 At a glance, we can see that Brady demonstrates a more reliable game overall, with a higher completion rate in the middle of the field, whereas Wilson’s completion rate drops as his team progresses further down the field. So are the performances of Brady and Wilson a question of field position, or could it potentially be a situational factor that drives them to rise to the big occasion? The Super Bowl draws the largest following of any event on the annual sporting calendar (see our other Super Bowl article, Analyzing the 2015 Super Bowl with data visualization, for further details). With over 100 million eyes fixated on that pigskin each year, an immense amount of pressure burdens those athletes who are tipped to perform. So on the big day, when push comes to shove, which QB will stand up? Brady once again asserted his unbelievable throwing prowess, ranking second for total passing yards (4109) by any quarterback in the 2014 NFL season. We compared his remarkable throwing record to Wilson’s, analyzing how their passing games held-up when their teams were at various point differentials throughout the season. The data from 2014 showed that when the Patriots were able to secure a points lead over their opponents, Brady was not afraid to flex his throwing arm, passing for a total of 2743 yards. This nearly doubled that of Wilson’s yardage when his Seahawks held a lead, throwing just 1407 yards by comparison. However, it’s during clutch moments, when the scores are tied, that Wilson’s passing game helped drive his team further down the field in 2014, with 1068 yards gained compared to Brady’s 462 yards. For a game set to be a nail biter, if the scores do come down to the wire, will it be Wilson’s arm that gets the Seahawks out of trouble? It’s no surprise that the more you pass the ball, the greater chance you have of being intercepted by the opposition defense. Regardless of Brady’s large yardage gained when his team was ahead on the scoreboard during the regular season, he ended up throwing a total of eight intercepted passes. Is this a sign that Brady becomes complacent, or overconfident, when in the lead? And could this act as an invitation for Wilson to get back in the game if the Seahawks are trailing on Sunday? Contrary to Wilson’s composure when the scores are tied (throwing more yards compared to Brady), it was when his team arguably needed him the most, when they were losing games, that he threw eight intercepted passes. Now that we have a good understanding of the comparative strengths and weaknesses of both the QBs passing games, let’s hypothesize that each teams’ defense is switched on. Where will they turn? Rushing split: Can’t throw over them? Can’t throw around them? Just run through them! In the 2014 regular season, Wilson tied first for most rushing yards by any QB (849). Graphing his average yardage per ball carry, against rushing attempts resulting in a 1st down, highlights the power of Wilson’s running game. On average, Wilson’s rushing attempts resulted in a 13-yard gain in the first quarter of games. This progressively falls throughout the course of a game, dropping to an average of 5.5 yards by the fourth quarter. Could this be an insight into his level of fitness? If Wilson burns out towards the back-end of games, perhaps this is an area the Patriots could look to exploit? It’s interesting to note the inverse relationship between rushing attempts resulting in 1st downs and the average yards gained per rushing attempt. This rising trend suggests that, even though his rushing attempts progressively average fewer yards gained each quarter, they become more successful at securing the 1st down as the game wears on. In fact, the greatest deviation between the two measures is seen in the fourth quarter – a very useful skill to close-out those big, tight games. But gridiron is more than just a game of four quarters. We had a closer look, comparing the rushing attempts resulting in 1st downs with the average yards gained per rushing attempt, in clutch moments – the type of moments likely to be encountered during a gripping playoff for the Super Bowl. High-pressure situations can make or break a team on the big stage. Regardless, big moments didn’t seem to deter Russell Wilson throughout the season proper. Wilson averaged the most rushing attempts resulting in 1st downs, as well as the highest average yards gained per rushing attempt, in the fourth quarter when his team needed something special – when they were within seven points. However, whilst his average yards gained per rushing attempt remains high during overtime, the number of rushing attempts resulting in a 1st down drops significantly. Moving our focus onto Tom Brady’s rushing game, it’s immediately obvious that it is eclipsed by Wilson’s efforts during the regular 2014 season. During the first, second and fourth quarters of his games, Brady gained only a fraction of the yards per rushing attempt gained by Wilson. Similarly, Brady averaged far fewer rushing attempts resulting in a 1st down, compared to Wilson, on a quarter-by-quarter basis. So what about the tighter situations? How does Brady, a five-time Super Bowl QB, handle his clutch moments in a game? The data demonstrates Brady’s dislike for carrying the ball in tight situations. 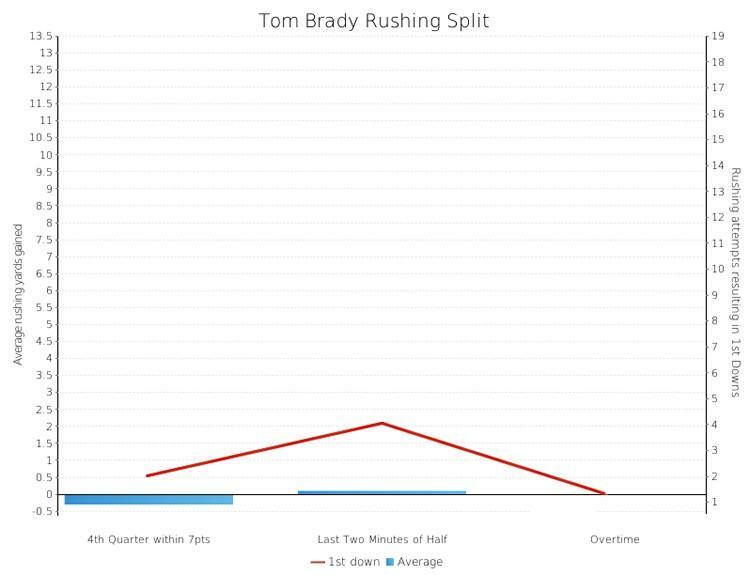 Overall, Brady astonishingly LOST ground when attempting to rush the ball in the fourth quarter. Perhaps “If it isn’t broke, don’t fix it” wouldn’t be the worst advice for Brady, who has such an effective passing game. Another interesting point to note is the absence of data for any overtime rushing attempts. Under the leadership of Brady, the Patriots were able to avoid pushing any games into overtime. Credit to his skills, composure and experience perhaps? Separating these two absolute stars of the game is no easy feat. And making the right decision on who may get MVP (assuming one of the QBs wins the title) without the guidance of Business Intelligence and data visualization would definitely be a long shot. Presumably, being the top-level teams that the Seahawks and Patriots are, we can expect the game to go down to the wire. In that case, if his performances in season 2014 hold true, it will be Russell Wilson who takes the Seahawks to their second title in two years with a MVP worthy showing. But, he must be wary of the experience Tom Brady will be carrying into the showdown. With Brady’s lethal passing game, if the Patriots get a big lead, history tells us, they will not let their foot off the pedal.